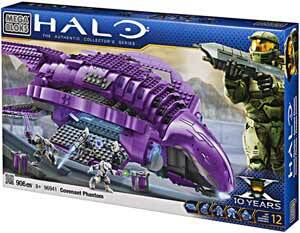 Description Of Item: An Elite Pilot maneuvers a Covenant Phantom into action-providing heavy cover fire from its three rotating plasma cannons, as it delivers a deadly Elite Arbiter and two Ultra Grunts to the battlefield, tipping the scales against their UNSC foes. This buildable set includes opening cargo doors, plasma turrets that rotate a full 360 degress, an Ultra Elite Pilot, two Ultra Grunts and introducing THE NEW SILVER ARBITER! !